As you know, Ferguson was recently in the media due to issues with racism. Have they reformed? No. This story is one of utter horror. It involves a family, who are on the tribal roll, CPS, and the corruption of law enforcement. This story is one that defies all logic, rationality, and law. It started when Rosemary, mother of a 16 year old located innapropriate photos on a cell phone. A 20 year old Muhammad Cisse of St. Ann, Mo. picked the girl up to take her to a friends house. However, that is not where she ended up. Instead, he drove her to a fitness center across county lines, and then to his home. Once there, he held the young girl against her will, even upon being asked to go home. While imprisoned, her family drastically searched and eventually found her. Muhammad, the abducter, called the police for a “welfare” check. Keep in mind, this man, as shown below, clearly had sexual relations with this minor. Perhaps she needed a welfare check against him. As if things could not get any worst, an official report, above, clearly confirms the abuse from Muhammad occured. To this day, against the familys’ wishes, the state has done nothing against these accusations. Instead, they removed the victim from her family, forcing her into isolation. Now, here is where more laws get disregarded. The girl and her family are enrolled with an Indian tribe. What this means is, legally the state must turn the child over to the tribe. However, the state has willfully violated these laws. 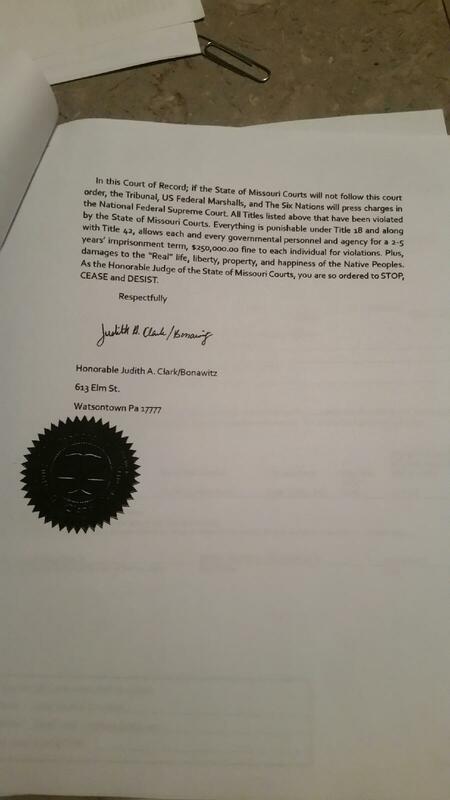 Above, is a legal notice from the tribe to the state. Within this letter, they confirm that not only is the family tribal, they notify the state of the various laws being broken; Senators are currently being involved by the tribe. Beyond this, the state has refused to release the child. This is a case of complexity and corruption in its purest form. This shows just how far the CPS/ DFS is willing to go for a quick buck. There is much more I can comment regarding this, with photographic evidence. However, for now, I hope this basic analysis works. As most of you know, the FCC wishes to gain control of your internet. Below is the countdown. What does this mean though? It means the Government would now control your internet. Now, the last time I checked, we are supposed to be in a free Nation… Let’s keep internet neutrality alive. Years ago I had made a very sad prediction as to the things to come. I look at the things that have happened since that time and it saddens me. The police, as it would seem, have now responded to petty crimes, and sometimes no crime at all, with lethal force. Now, this has brought forth a lot of issues. However, the big one that I hear mentioned on a daily basis just happens to be the race card. However, is it truly a racial issue? Although I can see how it could be taken as one, I don’t believe it to be truly a racial issue at all. Consider this: To keep a society at bay, or to invoke fear as a means of controlling the general public. After all, we can’t have the general public standing up against a pure, uncorrupted authority, now can we? Now, this could be a theory but this is not: America has a problem. Recently, the police of NYC decided they weren’t going to do anything… I mean anything less than the anything they were doing before. Basically this was going to prove just how much we need them. The results were interesting as crime dropped. Hmm, no police equals low crime. I think I can live with that. So with this protest epically failing, do we need the police? Well, if results like this are typical, the answer just might be no. This article is a bit random but these are just my late night thoughts. Feel free to share your thoughts, opinions, etc. on the recent situation. Just when I thought the United States Government could not possibly piss me off anymore than what they already have, I learn about Russia. It seems like there is a lot going on in the global scale of politics. In Malasia, we have a missing 777 that seems to have vanished into the abyss, America has a President that seems to be proactive in destroying the Nation from the inside out, and now we have Russia wanting to Nuke us…. you know… blow us to Kingdom come. The problem I have noticed with our country is we have a “Police the world” mentality. As a result of this, we get involved with affairs that have no bearing on our Nation; in fact, it isn’t even a security issue to us. Now, as most of you may already be aware, Kerry gave Russia a specific time frame to flee Kuwait. Now, I have been saying for years that eventually the United States will get involved in the wrong situation and we will be wiped from the Earth… Just a theory right? Well, Russia has replied to the demand by stating they will turn the United States into a “Nuclear ashland.” Now, doesn’t that just make you feel all bubbly inside? It is, to my best guess, that WWIII will eventually happen. In reality, you cannot just mettle in foreign affairs, piss off other countries, and not expect retaliation for it; hence, why I am an activist. We, activists, tend to have a bad image with those who follow every word the Government tells them. “Terrorists, threat to National Security” being among the names we are called. In reality, I feel that we are the only thing that will save this falling Nation… Assuming we aren’t blown to bits by Russia first. Following a minor conflict after a movie, Oklahoma Police used unneeded force to beat the man in the head. As a result of this beating, the man later died in the Hospital. This morning I woke up, had a cup of coffee, and sat at my computer to conduct my daily research into the global scale of things. Today, however, was pleasantly different. Normally when I review articles I see the usual “corrupt cop,” “Evil Politician,” “This actor did this,” You know the usual stuff. Today, as I said, was very different. I came across an article regarding the excommunicated pastor of the Westboro Baptist Church, Fred Phelps. When it comes to this I have to try… and I mean really try to have some form of sympathy for this family. Looking into the life of Fred, however, I see a life of hatred and bigotry to an extreme level. This level being to such an extreme that he actually would protest the funerals of children. As of now, I can only presume he’s dying of old age but it’s unknown at this time. As I read the article, one thing did stand out: His family managed to turn this event into one of hatred. As you may know, some of the Phelps family were also excommunicated from the church for not following their twisted beliefs. I suppose hatred will always begot hatred… no matter who it is meant for. Once in a while, when you look at American history, one just can’t help but be ashamed. For example, “All men are created equal.” Well, this statement was true at that time so long you were not African American, Asian, Mexican, etc. Eventually, however, we grew from that…or have we? Remember the women’s rights protests? You know, that time when women were not allowed to vote? As I said, “all MEN…” In the 1960’s Dr. Martin Luther King gave his most famous speech, “I have a dream.” He gave this speech with the hope that everybody would be equal regardless of Nationality, gender, or other preferences. Looking into our world and Nation today I see very disturbing trends. Well, to answer that question: The American People as a whole. Don’t get me wrong, I do believe Government has its place but I don’t deny that something is seriously wrong with the current Administration. Gun Control, Obamacare (Look into that one… seriously,) and countless “hidden” policies that have seemingly slipped through Congress are only small tokens of what is yet to come. Dictatorship? Communism? Marxism? The thing is Americans are still in a position to be able to fight back; it is for this reason I started my Facebook page “War on Corruption.” However, I don’t want to just attack the administration, that just wouldn’t be fair. DHS buying thousands upon thousands of rounds of ammo… why? You tell me. The police force being used as “henchmen” for both Child Protective Services and representatives with hidden agendas… Something is wrong. As somebody who is proactive in the realm of politics, it isn’t uncommon that I see some rather horrifying stories. When The Patriot Act came around, I thought I would have to smack myself to see if I was dreaming; sadly that was just the start of the end for America. The act was supposed to tighten national Security with the intention of 9/11 being avoided in the future. the problem with this, however, it came with a hefty price: your freedom. To my Amazement, the destruction of our Freedoms didn’t just stop there. I saw the birth of the Homeland Security and the TSA. Almost immediately I saw the damage they were doing. People at Airports were being pulled into backrooms and stripped searched for no apparent reason; to my understanding, this should have been a violation of the Constitution. However, Bush had found a way to justify it. I saw the election of Obama and knew things would only get worst. I warned everybody I knew of the impending doom to come. “No, no, I think he’ll be a better President,” they said. So far I have seen the DREAM Act passed which gives immunity to specific immigrants who are at risk of being deported. I have seen Obamacare, which is much more than just “healthcare.” I encourage that anybody who reads this do some research into that one. Worst case scenario happened when we all saw Obama vow to act without the use of Congress. In America, this was an act that was simply unheard of… This was the beginning stages of a Dictatorship. With or without Congress, Obama would get gun control laws passed as a perfect example. “I need some proof.” I can hear those words coming out of your mouth even now. Good news, I have the article… enjoy. The point to this writing is this: As Americans, we have a duty to defend our nation from both, domestic and foreign, threats. From my stance, Obama is a domestic threat to our Nation with an approval rating at approx. 38% (Last I had checked anyways.) The sad part is I haven’t seen much action from the people. I don’t see petitions being signed… I don’t see another Boston Tea Party. These are my thoughts for the day.